Harvard International View 21 review | What Hi-Fi? 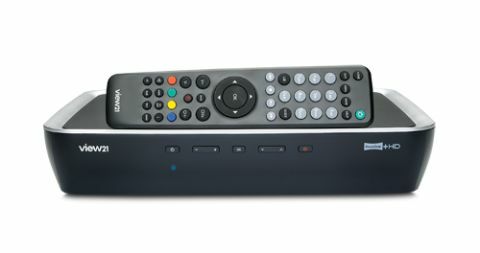 The arrival of YouView has galvanised the PVR market and here's another new take on the Freeview box, the Harvard International View21. Setup is straightforward, so you'll be enjoying Freeview TV in around five minutes. The quality's very good, too: it delivers admirably clear and controlled pictures from standard-def channels, while HD content is vibrant, crisp and detailed. As you'd expect, you can record one channel while watching another, or record two at once, and with a choice of 320GB or 500GB HDDs, you've got plenty of space to use. The View21 also has a couple of tricks up its sleeve in the form of two iOS apps. View21 Photo lets you throw pictures from your iPhone or iPad to your TV screen via the View21 box; it's a little sluggish but still useful. View21 Play, meanwhile, is far more interesting - it lets you control your box, but also watch live and recorded programs directly on your iOS device. It's not perfect (HD programs aren't compatible, for example) but it is a handy feature that performs very well, especially on iPad. The problem is the performance of the box itself. The View21 just isn't quick enough, which quickly becomes frustrating. Combine that with uninspiring menus and you've a device that's just not particularly nice to live with. We couldn't get our review sample to output surround sound, either. While YouView offers a load of integrated on-demand content, View21 has apps for just BBC iPlayer and YouTube. It might be cheap next to the Humax DTR-T1000 YouView box, but View21 also lags a fair way behind on features and function.